Copenhagenize.com - Bicycle Urbanism by Design: Promoting Cycling in the Netherlands - Earn Money! Promoting Cycling in the Netherlands - Earn Money! Anyone cycling to work from Zaandam or Amsterdam Noord, in the Netherlands, in the last week of September, could earn €5.00 a day. This was a special campaign week to draw attention to cycling as an alternative to commuting by car as well as to stimulate people to actually use their bicycles. Participants could register by means of a website. After registration they would receive a barcode by mail. When cycling to work in the morning between 06.45 and 9.30, people could earn €5.00 a day by having the barcode scanned on the ferries across the IJ. The bicycle route from Zaandam to the parts of Amsterdam across the IJ is one of the five routes to be tackled and promoted as part of the ‘Fiets filevrij!’ (Cycle without traffic-jams) project. Plans to reward cyclists exist elsewhere, too. In Nijmegen local authorities intend to provide cyclists with transmitters in order to collect data on the use of the local bridges. Participants may save up for presents. And in Delft there are plans to promote a new high-speed cycle route by offering rewards to cyclists. A comparable approach is already being used in the Trappers (Pedal) project whereby companies encourage commuting by bicycle. Each commute by bicycle earns an employee of the participating companies a certain number of pedals. This ranges from a set number of pedals a day to a certain number of pedals for each kilometre. An extra bonus, for instance, for cycling in the winter months is also one of the possibilities. Participants in this programme have a special transmitter on their bicycle. 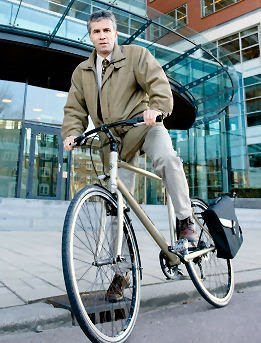 The company is provided with a device recording whether employees actually travelled by bicycle. The pedals entitle participants to gifts.